It’s baaaaack! 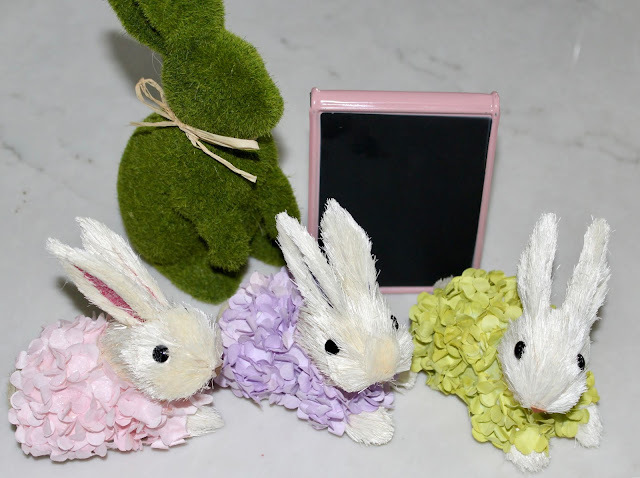 Filled with bunnies and spring cuteness! And do you notice anything else? I got a new tray! I love the one I had, but with the colors of my house, I was just really craving to get a white distressed one so this new one is exactly like the old one and now I have two decorate, oh no! AND this tray now comes in black too!! Once again, most of the stuff on is from Michaels Crafts, Hobby Lobby, Wally World or things I already had on hand. Those pink and green things are little napkin rings I used as mini wreaths. Remember I used the little pink easel and stands for the Mini Cadbury Creme Egg Cupcakes. 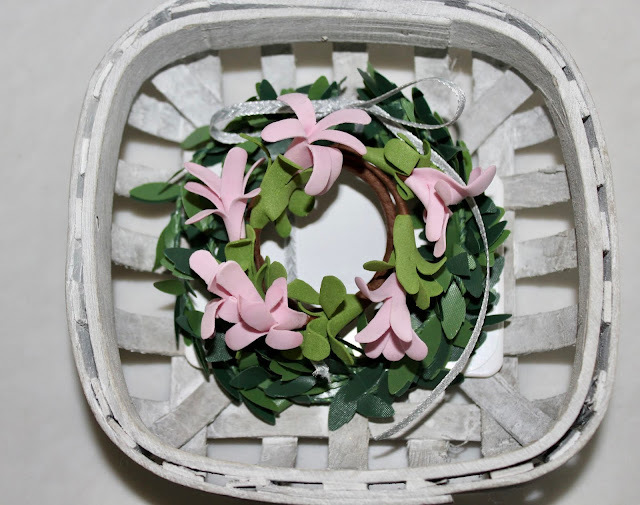 I just stuck a napkin ring inside my mini tobacco basket wreath. 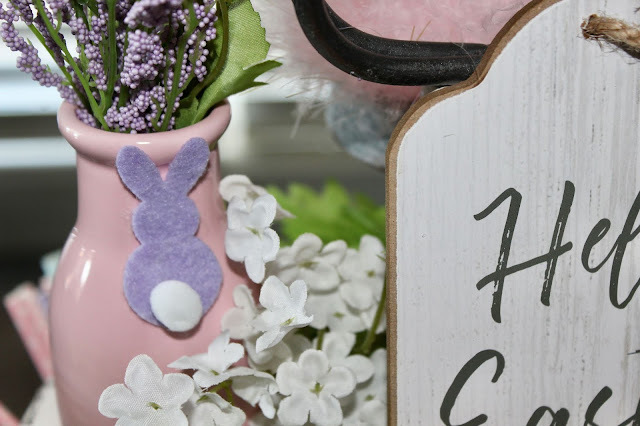 I took some of the felt bunnies off the craft clothespins and used double sided tape to sick on on the vase and one on the easel. I’m actually really happy that Easter is later this year so this goodness can stay out longer. 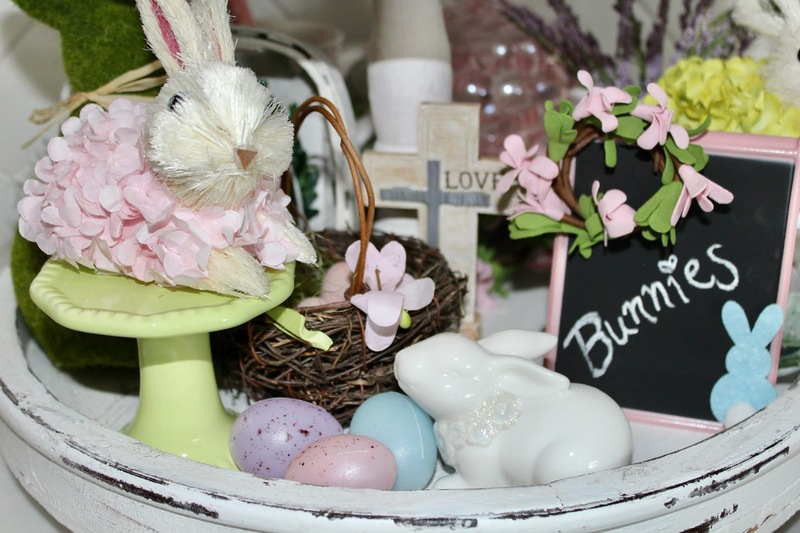 I’m just loving all the spring colors and to think I originally wasn’t going to decorate for Easter. Now, what are your thoughts? Do I decorate it for Memorial Day and leave it up to Fourth of July or do I do a summer theme? Some friends of mine are sharing their Easter tray cuteness today too. 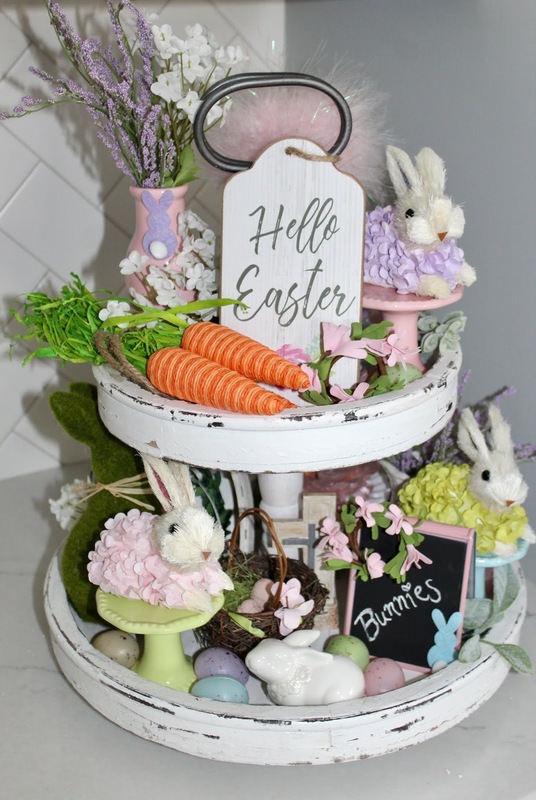 "HOP" on over to Laura at The Horton Family, to Lisa at Coast to Coast ....You will love what they did with their Adorable Trays for Easter!! Oh and our sweet Kellyann did her too! AND HAVE A HOPPY DAY!!! So cute. These trays are so fun to decorate. I’m pulling all my Easter stuff out this week. I love that you bought the lighter finish tray. It really will look great with your decor. You really got creative with this one. 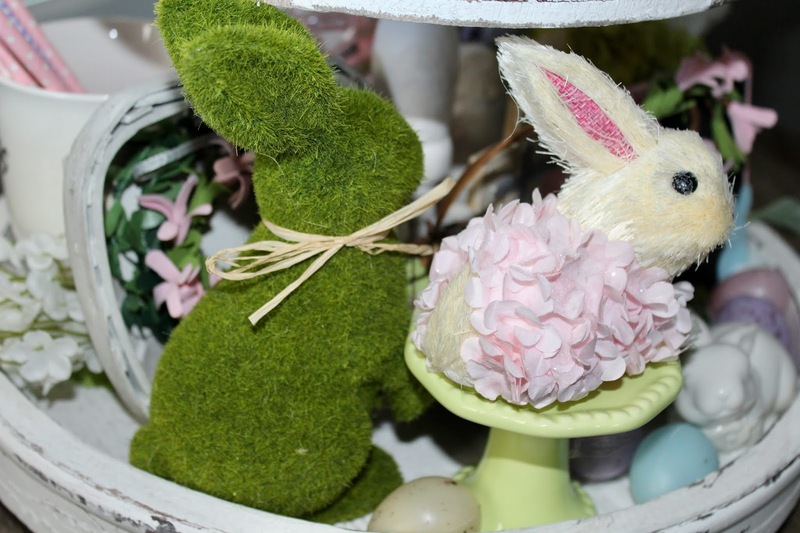 I'm hoping to get around to some Easter decorations this week. I also like that it falls a little later this year. Have a wonderful week! Adorable is exactly how I'd describe your tray! That napkin ring inside the tobacco basket looks so good - just like a perfect wreath, so clever! 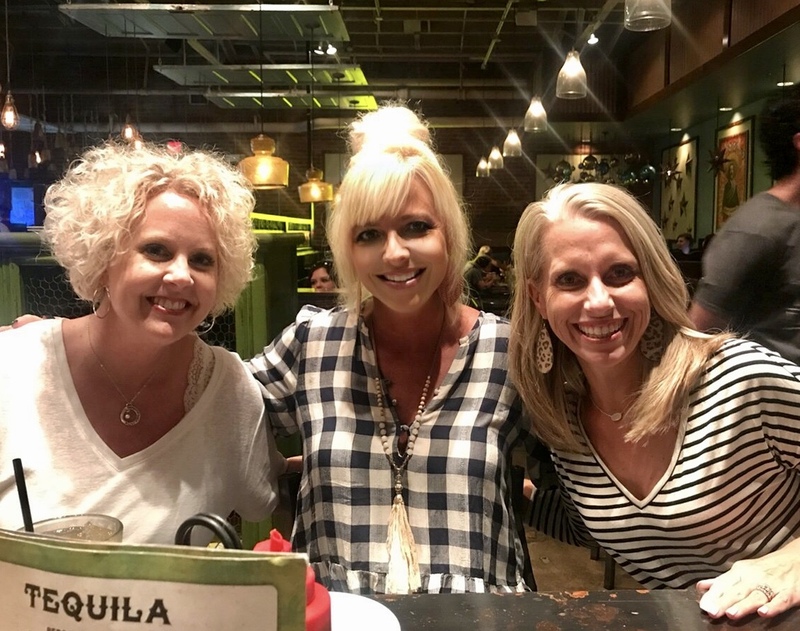 I love that picture of the three of you too - great memories! You are making me want to get a tiered tray too! I love how you keep it so festive. I am glad Easter is later this year too, it spread out the spring festivities a bit. Sometimes they are all piled right on top of each other. Have a lovely Monday! I love the distressed white! The little decor on it is so cute too! 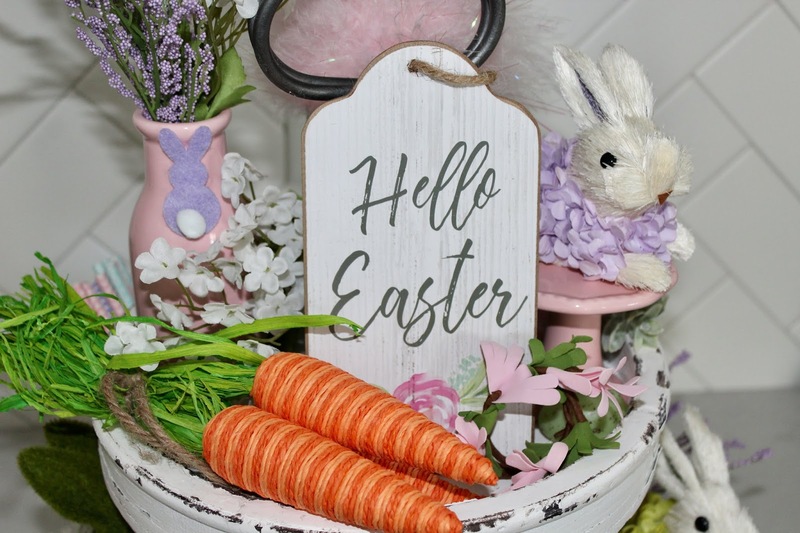 I need to get something new for my wire basket but keep going back & forth on whether I want little eggs for Easter or something for spring in general so I don't have to change it again so soon since I have limited storage for all the decor lol. Super, super cute!! Love those little eggs! Your Easter tray is SO pretty! I love this time of year because I was born on Easter Sunday!! I knew it! I couldn’t wait for the Easter tray. Love it!! So fun and cute! Happy Monday, I hope you have a wonderful day. 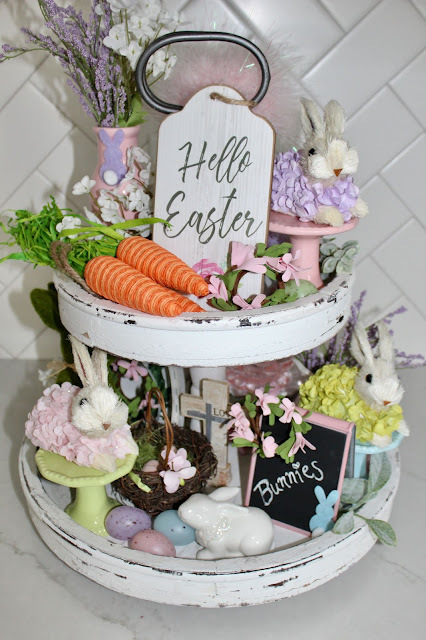 I love every sweet, springy, detail of this tray. You're so talented my friend. And great finds on those pedestals! You make me want one of these so badly. Where do you keep it? I usually add pops of patriotic in my summer decor! I know I've said it before, but you have such a gift with decorating, Andrea. I don't have one of these trays yet, but they are great for putting all the small pieces together!! Easter is my FAVORITE holiday, so this makes me extra happy for a Monday morning. I love all the Spring colors and little touches. I think a red, white and blue would be fun...then you could maybe use some, but add in some Summer flair to go with it. It will be great no matter what you do, you have a great eye! oh that is adorable!! Well done!! 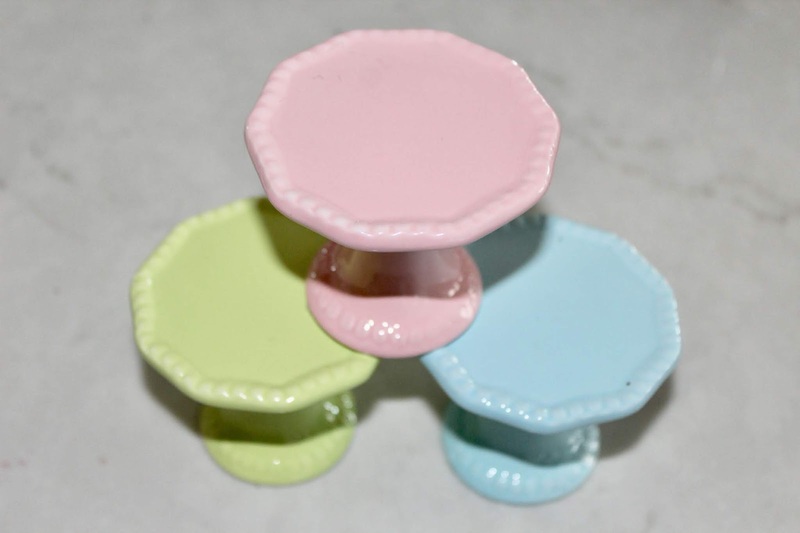 The detail you put into these tiered trays Andrea is just fantastic! Easter is one of my favorite holidays and I would love to try something like this to brighten up the kitchen! So cute! Great job. I love all the little details. Those bunnies are just adorable. Like they have on little tutus or something. So wee and precious. Have to go right now and add a cross to my tray. I meant to do it as I was putting bunnies and eggs on there. Should have been the first thing I added, not the last. Makes me ashamed of myself. Love the chubby bubble glass. 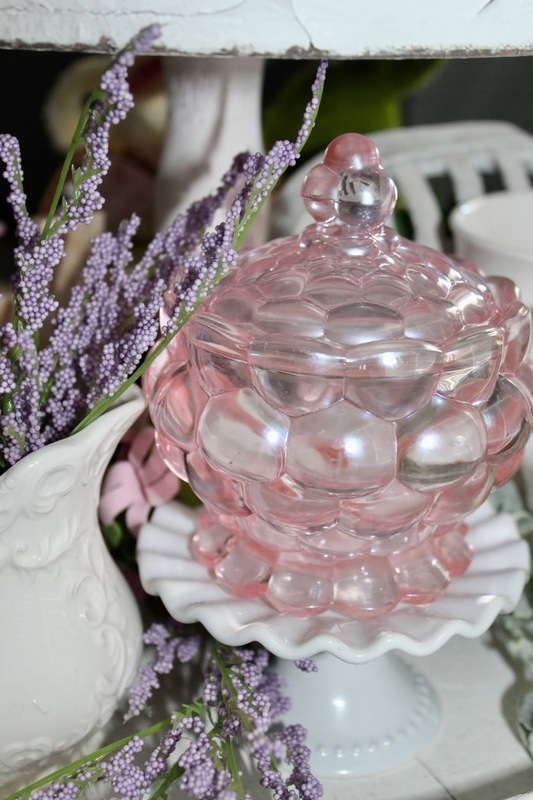 I have my mom's pink glass hors d'oeuvre tray out but I don't know what to do with it!! Maybe just set out some jelly beans on it? That is so cute and those bunnies are adorable!! I did some Easter decorating this weekend too and I recognize some of the items on the tray from Hobby Lobby! You did a great job! OK.. that is adorable. & I'm SUPER impressed at the idea of the mini basket & using that napkin ring. THAT IS SERIOUSLY GENIUS! I'm loving all of your tiered tray decor and I'm sure enjoying mine. I go from Easter to a summer theme and leave it out until I go with a fall decor. Yes, your use of the napkin ring gets a "gold star!" Hugs for a great week Andrea! Each one just keep getting better and better! And I love seeing those cute little bunny faces. I couldn't see them on Insta, so I'm glad I could see them here! I just wanna squeeze them, they are that cute! :) Good thing there are so many holidays each year - you'll have at least 9 different trays by the end of the year! I'm so excited for the next one! Cute! I need to get my Easter out this weekend. 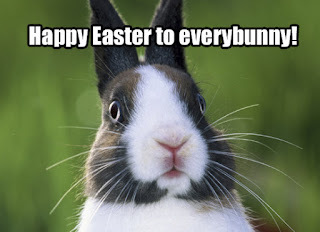 Yes, late Easters are so much more fun than the shivering March variety! This is so cute!! 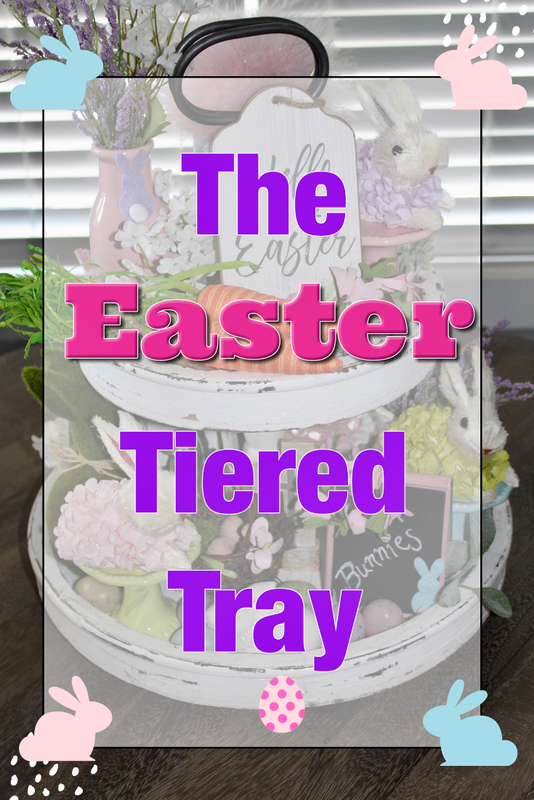 I really love all these tiered trays; it's fun that you can keep re-decorating it! I love this!! Those little flower bunnies are my fave! Love how you decorated your tray! This is the absolute cutest! Those flower bunnies are adorable! Oh my goodness, I can’t handle the cuteness!!! I always love Easter with the bunnies and all the pastels!! Absolutely love this, you have the cutest trays! So cute! I got some of those moss bunnies too! I missed the bubble glass at Hobby Lobby darn it! I need to check again! I loved all the cute items they had! Your tray turned out so well! I'm already brainstorming a summer one or 4th of July! Another beautiful tray! I bought a tray and am working to get it decorated. You’ve inspired me to hurry up and finish it. The new tray looks great! I love all of the spring and festive fun you filled it with. I'm also happy spring is later. There's a better chance for nicer weather and it doesn't feel so long in between the next holiday. So many adorable things here! I love the napkin rings turned miniature wreaths, as well as the mini tobacco basket. Perfect! I also adore those mini cake plates and the cross. Great job! Thanks for sharing at Sweet Inspiration! You know I always love your tiered tray decor. This is just darling! I love the carrots! I actually have those same ones, I think! 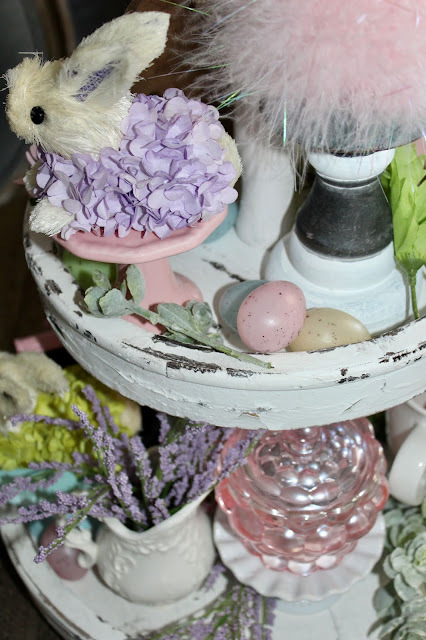 Beautiful Easter vignette love the colors and textures. This is so adorable and festive! Thanks for linking up to Best of the Weekend! You were our most clicked feature this week! So so cute! 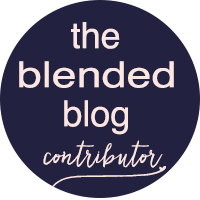 I am so happy to feature you at TFT this week. Thanks for sharing!